I also made some delicious Stuffed Chicken this week from here, I hadn’t used a recipe from this site, but I will now after trying this one! I didn’t take a picture so I used the one from the blog. I halved the recipe, and it still produced leftovers that were delicious heated up. I also made some gluten free bread crumbs from my bread and nixed the basil since I didn’t have any. This came out very well and will definitely be repeated. Served with a salad. 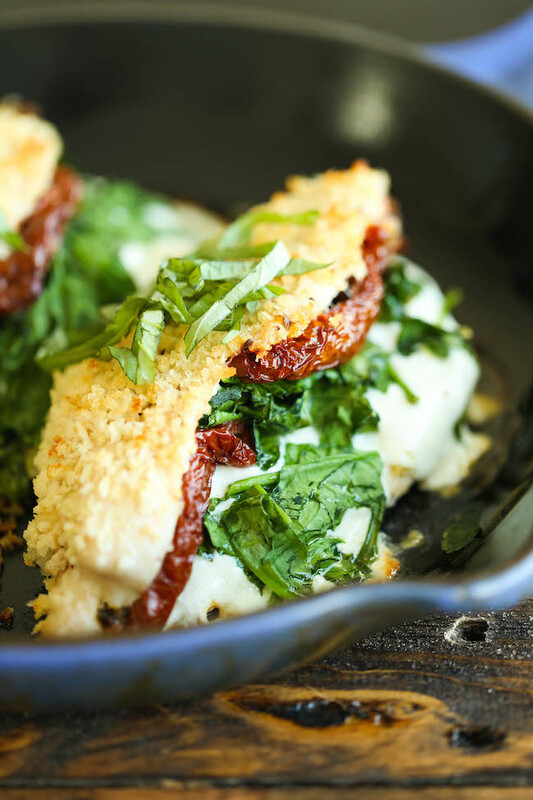 Chicken breasts stuffed with mozzarella, spinach, and sun dried tomatoes – baked to absolute crisp-tender cheesy perfection! Season chicken with salt and pepper, to taste. Cut each breast horizontally to, but not through, the other side to create a pocket. Lift top flap of chicken pocket, arranging cheese, spinach and tomatoes. Working one at a time, dip chicken into the eggs, then dredge in bread crumbs, pressing to coat. Place chicken onto the prepared baking dish and bake until the chicken is completely cooked through, reaching an internal temperature of 165 degrees F, about 25-30 minutes.